« Help Farmers – Get More Greens! 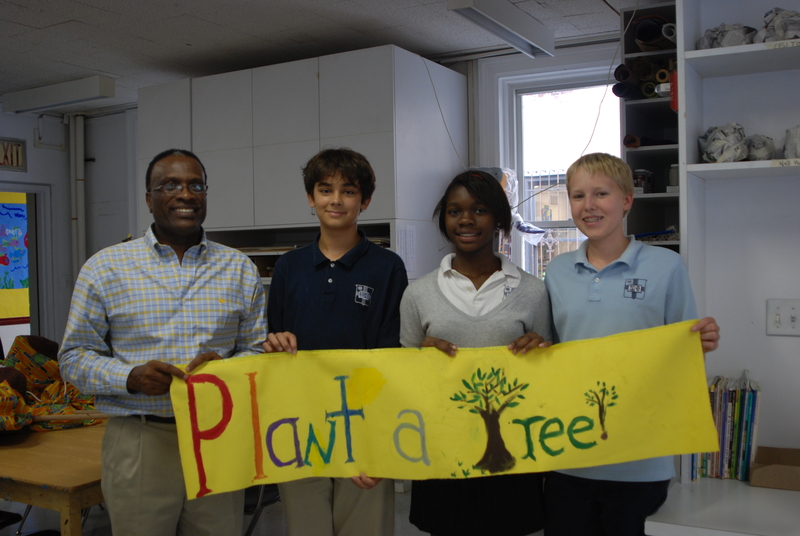 We were so lucky to have GBM Executive Director Professor Karanja visit GCS in his busy schedule this week. Mr. Kanaja was meeting with UN officials to discuss plans to build an institute for Peace and Environmental Studies in honor of Wangari Maathai in Kenya. Our GCS puppeteers had a chance to give him a tour of GCS, and to show off our puppets and banners for our annual peace march. Professor Karanja was impressed with our 8th grade hosts, and with the building and programs we were able to share. We were honored to have him here, and look forward to our new connection with Kenya. Our GCS Green Team will be creating a “green pen pal” program with the Sparki School in Mombasa this year. Stay tuned! This entry was posted on September 25, 2011 at 2:27 pm and is filed under Community. You can subscribe via RSS 2.0 feed to this post's comments. You can comment below, or link to this permanent URL from your own site.